coins back in your pocket. It’s the number one question asked by people with coin collections of all shapes and sizes: how much is my coin worth? At Glenview Coin & Collectibles, we’re here to answer that question and offer top-dollar for foreign and domestic coins, currency, and more. Located in Glenview and serving the surrounding areas of Wilmette, Winnetka, Skokie and beyond, our certified coin dealers have been trusted for over 30 years to help you determine your coin’s value with honesty, integrity, and accuracy. Glenview Coin & Collectibles can appraise U.S. coins, U.S. currency, foreign coins, foreign currency, and other antiquated forms of money. No matter the condition, our Glenview coin appraisal team can help you make money with money by determining your coin’s precise value through a rigorous professional evaluation. Continental currency and colonial currency, issued before and after the American Revolution. Treasury notes, issued from 1812-1913 during the War of 1812, Civil War, Mexican-American War, and other times of war. Demand notes and fractional currency, issued during the Civil War due to coin shortages. Interest bearing notes and compound interest treasury notes, issued from 1863-1865 in values from $10 to $1,000. United States Notes and Legal Tender Notes, produced through 1971 and removed from circulation in 1994. High denomination banknotes, including $500 bills, $1,000 bills, $5,000 bills, $10,000 bills, and $100,000 bills. Gold certificates, issues from 1865 to 1934 and redeemable for gold coin. Federal Reserve Bank Notes, the currency currently in circulation today, including one dollar bills, two dollar bills, five dollar bills, ten dollar bills, twenty dollar bills, fifty dollar bills, and hundred dollar bills. World coins. No matter the country, we’re here to help you find the value of any coin minted across the globe. Ancient coins. If you’ve got a collection of ancient, antiquated, or rare coins with no clear markings or indications, we can help you identify their origin and value! Silver coins and gold coins. 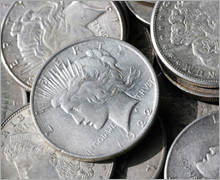 We can help you determine the value and help you buy or sell silver coins and gold coins of all shapes and sizes. Currency exchange. If you possess foreign currency that’s currently in use or circulation, we’re happy to help exchange it for current market rates. Half cents, minted between 1793 and 1857. Pennies, in large cents minted between 1793 and 1868, and small cents, minted from 1856 to present day. Modern collectable pennies include Flying Eagle cents, Indian Head cents, and Lincoln cents. Nickels, including half dimes minted between 1792 and 1870. Notable nickels minted since 1866 include Liberty head nickels, “V” nickels, buffalo nickels, Indian head nickels, and Jefferson nickels. Dimes, minted since 1792, including dimes, draped bust dimes, capped bust dimes, Seated Liberty dimes, barber dimes, Winged Liberty dimes, “Mercury” dimes, and Roosevelt dimes. Twenty-cent pieces, produced for only between 1875-1878. Quarters, minted in silver from 1792-1998 including Draped Bust quarters, Capped Bust quarters, Seated Liberty quarters, Barber quarters, Standing Liberty quarters, and Washington quarters, and minted in copper-nickel since 1965, including Washington quarters, bicentennial quarters, and fifty state quarters. Half dollars, minted from 1794 to present, including Flowing Hair half dollars, Draped Bust half dollars, Capped Bust half dollars, Seated Liberty half dollars, Barber half dollars, Walking Liberty half dollars, Franklin half dollars, and Kennedy half dollars. Dollar coins, minted since 1794, made from silver, gold, copper-nickel, or brass. Dollar coins include Flowing Hair dollars, Draped Bust dollars, Gobrecht dollars, Seated Liberty dollars, Liberty Head dollars, Indian Head dollars, Trade Dollars, Morgan Dollars, Peace Dollars, American Silver Eagle dollars, Eisenhower dollars, Susan B. Anthony dollars, Sacagawea dollars, and Presidential Dollar Coins. Civil war tokens, coins primarily produced between the Civil War years of 1861-1964 due to a lack of availability of government-issued currency. Civil war tokens include store cards, patriotic tokens, and silver tokens. For over thirty years, Glenview Coin & Collectables has been a family-owned business rooted in honesty, integrity, and expertise, proudly serving Glenview, Wilmette, Winnetka, Skokie and beyond. Our reputation among everyone from professional numismatists to amateur collectors is of trustworthiness, accuracy, ensuring your coin, currency, or collection is in the right hands. We proudly buy and sell individual coins and currencies, complete collections, and complete estates, helping you out through every step in the process. If you’re ready to part with your coin collection, looking to buy gold coins in Glenview, Winnetka, Wilmette, or Skokie, or get a currency appraisal, visit Glenview Coin & Collectibles today! Glenview Coin & Collectible Inc carries an abundant selection of Unites States and foreign coins, paper money, stamps, sports cards, estate jewelry, lovely modern jewelry, unique political, military and sports memorabilia as well as other collectible items. Browse our website to learn more.